I love fall. Love every part of it. It’s time to start pulling out my fall decorations and quilts. I thought I’d share some Fall and Halloween inspiration with links to some of my favorites, including re-visiting some oldies from the past. One of my favorite – and most popular – recent projects is this super simple, scrappy Patchwork Pumpkin quilt block. I made mine from all scraps. 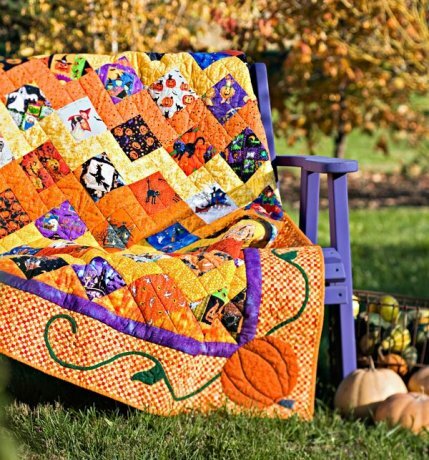 This simple Halloween quilt is perfect for showing off cute novelty Halloween prints. This quilt was the prototype for this free Moda Bake Shop tutorial if you want to make something similar. 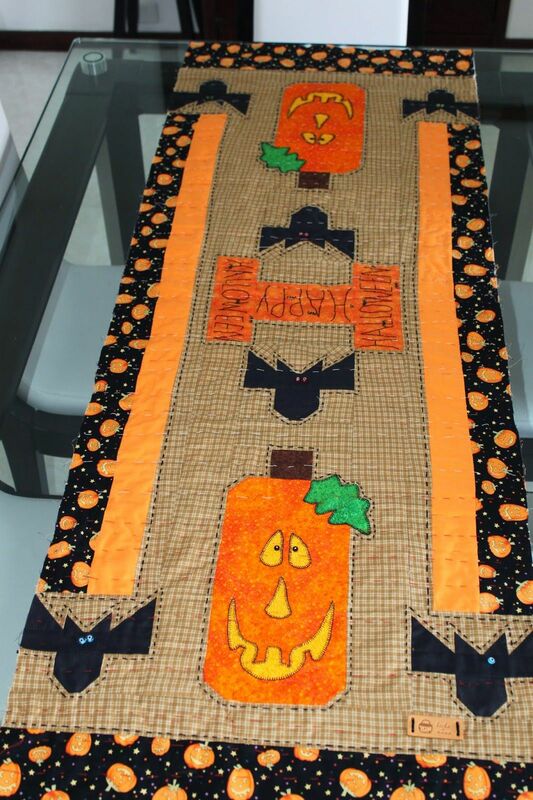 This is our Halloween quilt I made a few years ago. I wanted to do something modern in Halloween colors that would use up lots of scraps as well as the assortment of novelty prints I’d collected over the years. This is a fun style if you’re not as into novelty prints. Another quilt using Halloween colors, but not overtly Halloween-y. This chevron quilt tutorial by The Little Fabric Shop is one of the best chevron tutorials I’ve come across. I’ve got it pinned to use sometime soon. And I love it in the fall-ish/Halloween-y fabrics. If Halloween is not your thing, here are some fall/autumn-themed projects to inspire you. This is my version of a Modern Maples quilt – taking a traditional maple leaf block and blowing it up. Another example would be a quick mini quilt. This one is made with the 2 1/2″ charm squares (Quilter’s Candy by Moda). 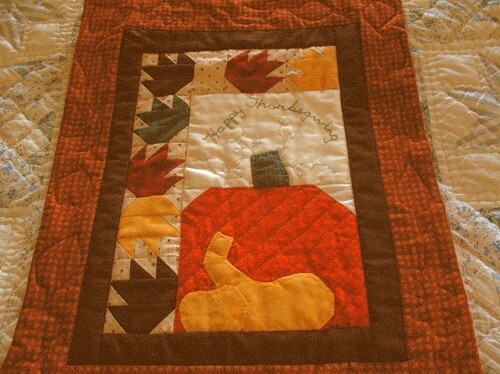 Probably my all-time favorite fall-themed quilt is my Gratitude quilt I made for Thanksgiving a few years ago. This is one that had been on my bucket-list for a long time. It’s a record of the things I am most thankful for. I wrote this as a pattern for the book Sweet Celebrations. You could also use any traditional signature block to create your own similar result. If you’re interested, you can see more Fall and Halloween sewing and quilting ideas on this pinboard.